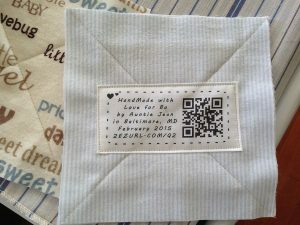 After many trials and errors, I finally got my labels printed on fabric for the quilts I’m making! It’s been a huge learning curve on making quilts and my initial attempt at just handwriting the labels with fabric pens proved to be not as appealing as I had hoped. Turns out that writing on fabric is not quite so easy nor legible. The next hurdle was getting the printer ink to set without washing away. This was again not an easy task. My main printer is an old inkjet HP Photosmart. It prints fine and I’m familiar with it so I was able to create 4″x6″ stabilized fabric pieces to run through the printer using the built in 4×6 tray. I did the whole let it dry, heat set the ink with iron, soak it in vinegar to supposedly further set the ink, a quick rinse in water and allow to dry. Result was that most of the ink would run and washed away. Just printing and let dry, wash it and the ink disappeared. Printing and heat set with iron also washed off most of the ink, it left a greenish trace of what the printing looked like from black ink. Heat set and then soaked in vinegar didn’t make much of a difference than the previous method. I wonder if I can just skip this step altogether with labels I eventually printed with success. The problem with the ink running isn’t so much the methods I used but rather with the type of ink I had in my printer. It turns out that pigment ink is what sticks around while dyed ink will just wash away. Pigment ink is the more permanent ink which also equate to the higher price tag on ink cartridges, it’s said to be non-yellowing, archival, and doesn’t fade over time, typically seen in photo printing. 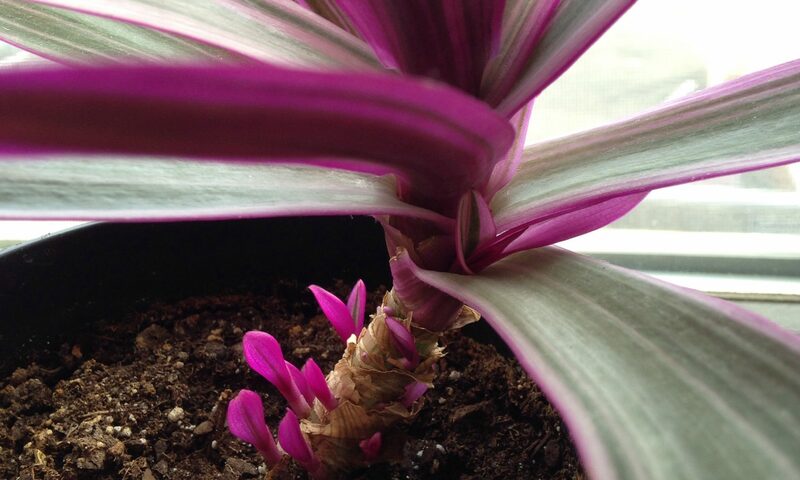 Even though my HP printer will do great photo printing, it doesn’t use pigment ink, it’s dyed. There is also a product called Bubble Jet Set and Bubble Jet Rinse to help set ink to fabric by prepping the fabric to take the ink better. I didn’t want to go that route with extra work and expense until absolutely necessary, plus I’d rather limit my use of chemicals and use more natural products. After scouring the web for a solution to my new problem, reading countless forum threads, watching dozens of youtube videos, and sifting through numerous blog comments, not to mention the constant brainstorming I endured to figure out a way to make it work in the most cost effective way, I realized that I have an even older piece of crap Epson cheapo printer that came bundled with some computer purchase my brother made many moons ago. The only reason I have kept this printer is because it has a photocopy feature that doesn’t need to be hooked up to a computer to work. Every tax season I dredge it out to make copies of forms and documents and it barely works. The ink is super expensive and it runs out fast, it doesn’t print very well and it’s completely finicky and slow. BUT Epson inks are supposedly pigment ink! So my brilliant idea was to see if I can use it print up a label. Sounds easy enough…. After realizing that despite a 3/4 full black ink cartridge, if the other 3 color cartridges are empty, this printer simply will not operate at all. And I wasn’t about to fork out $15+ for each of the 3 cartridges on this printer to see if using it for printing on fabric is an option. So I had another brilliant idea! :yes: I’ll just buy some cheapo refilled ink from Amazon.com for this printer and swap out the empty color ink cartridges with non-genuine Epson ink but use the genuine black Epson ink that’s pigmented to do my fabric label printing! I ended up getting the 12pk for $15, it was cheap enough to test. If it works and for some reason I want to do color labels down the road, I can always fork out the cash but I seriously doubt it. I can always use the cheap ink for printing on paper. Two, maybe three days I spent messing with the printer after the ink arrived. The trick of swapping out the cartridge did work, the printer would pop up with a dialogue about recognizing that I’m not using genuine Epson ink…um, whatever! Running the clean nozzle and head 4 times finally produced a cleaner looking image on paper. The true test is on the fabric. I had paper jams, errors and more errors, slow response, non-response…this printer just doesn’t play nice at all :pain: but after numerous threats of its impending death by a second story window toss, it began to cooperate! I’ve learned a few things about this printer’s massive limitations and have finessed it within it’s parameters to produce a decent looking label. The Genuine Epson Ink doesn’t seem to wash off at all in water or through laundering, YES!!! I still created my stabilized backing in the standard 8.5×11 size but I would cut out 4×6 size fabric pieces to iron onto the backing along with filler fabric for the empty spots. This way I can do my graphic design in a 4×6 environment and print it off on different sections of the page without wasting a full 8.5×11 piece of fabric. It peels off easy and I can reuse it a few times by ironing a new 4×6 piece to replace the one I printed and peeled off. Less waste is joyous! I’m really happy with the way the labels came out. I used a white 100% cotton muslin fabric and the black ink really popped. I did set it in a pan of vinegar to supposedly set the ink more after I heat set it with the iron for 15-20 seconds for a few rounds. I did test with vinegar and without, frankly I can’t tell the difference. Neither washed off in soap and water and both looked similar without fading. If the Epson ink didn’t work out, my next option was to get a lower end Canon PIXMA as I read others have had success using a Pixma. Glad I didn’t have to spend more money now than I did, I’m sure my husband is happy too! Eventually it would be nice to get a newer wireless photo printer, but for now, this will do. Printed fabric label sewed to a quilt square, how cute is that? 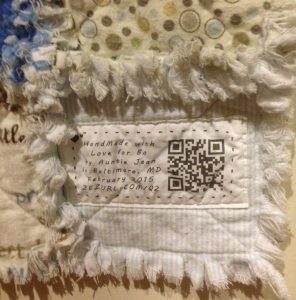 Printed fabric label sewn into the quilt, looks awesome! 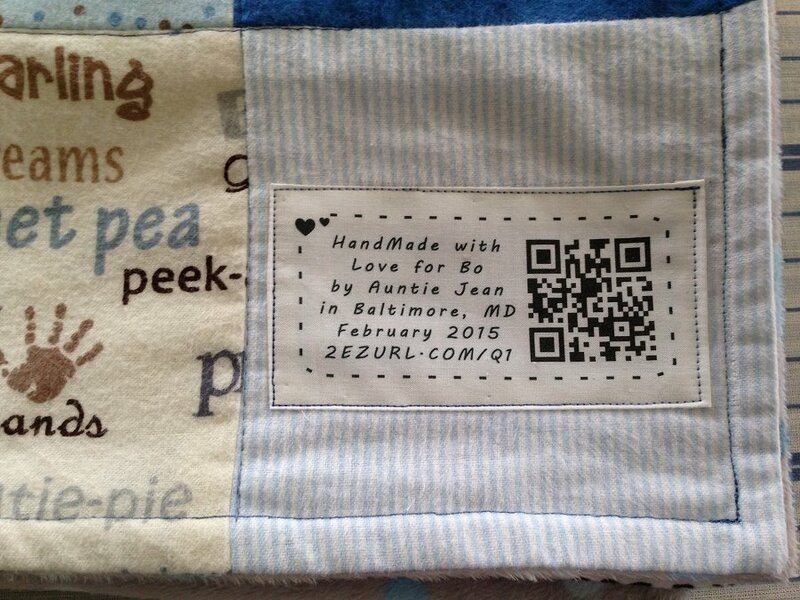 Printed label here has been washed twice and it still looks great and the qr code still scans! 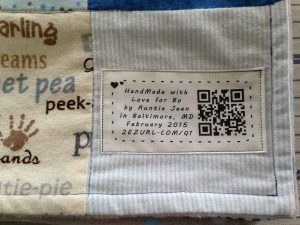 One of the big pluses to printing your own labels on fabric is that you can customize it however you want, whether it’s on a page of labels or each individual one. 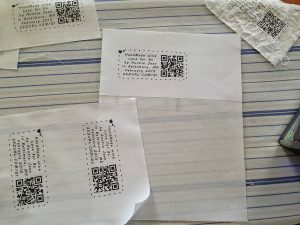 Here I have decided that since starting out with my sewing projects and quilt making that it’s a nice idea to label them with different unique QR codes that reference a shorten url to a page that talks about that particular sewing project. The reason for my own vanity shorten url site is to have more control over all my links. 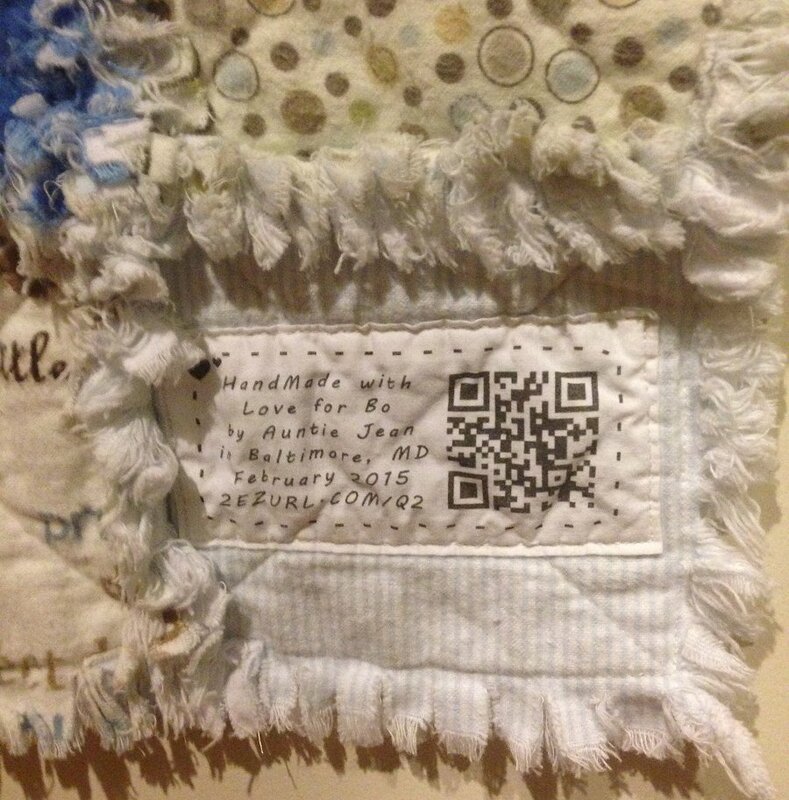 The shorter the url, the less complicated the QR code graphic will look. 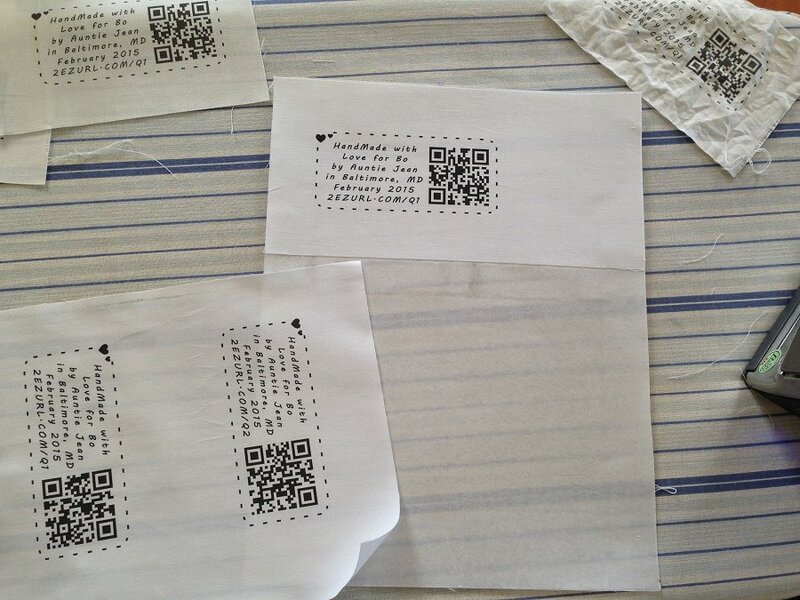 On fabric, a less busy qr code graphic may be more important than on paper. Previous PostPrevious I made my first quilt for my new baby nephew Bo! Next PostNext My first Rag Quilt is finished!